I have been running the Holland Park Suzuki Group from my family home in central London for twenty-five years. Over that time I have taught more than 200 pupils, many of whom have stayed with me throughout their childhood and formative years. Uniquely, I teach parents to learn alongside their children in the early stages so that they can become my stand-in teacher at home, and as the child progresses, they are able to supervise more advanced practice. Even adults who consider that they have little or no musical ability, often surprise themselves and quickly learn to make a good sound. 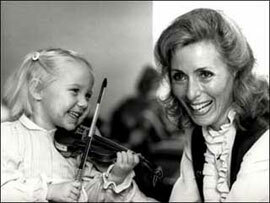 As a ‘Suzuki mother’ with her own (now grown-up) children, I have learned some very important points about the teaching of violin by the Suzuki method. Namely, I believe children are never too young to start learning and ideally babies should be exposed to beautiful classical music even before they are born. In my experience babies and toddlers learn by observation. That’s why I encourage parents to bring their children to observe other children’s lessons and group classes. They learn to sit still and listen, and soon develop concentration and a love of music. Eventually they want to take part themselves.